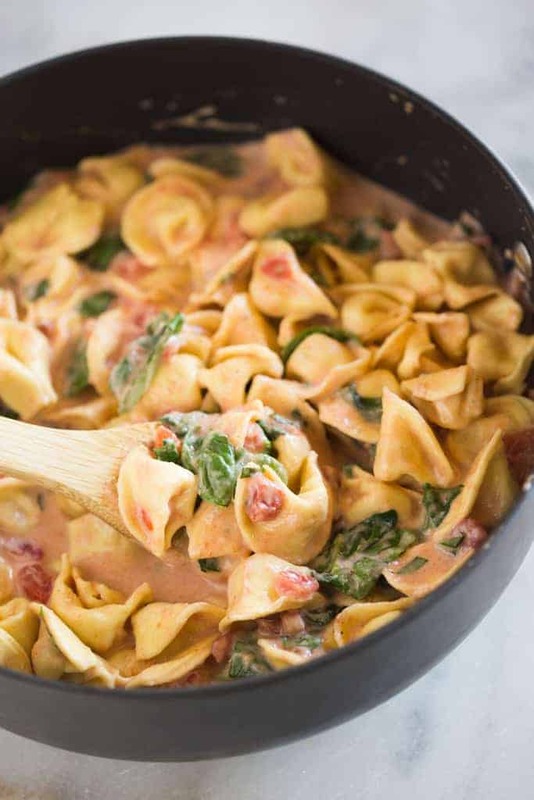 This Creamy Tomato and Spinach Tortellini pasta recipe is made in less than 30 minutes and perfect for a quick and easy weeknight meal. 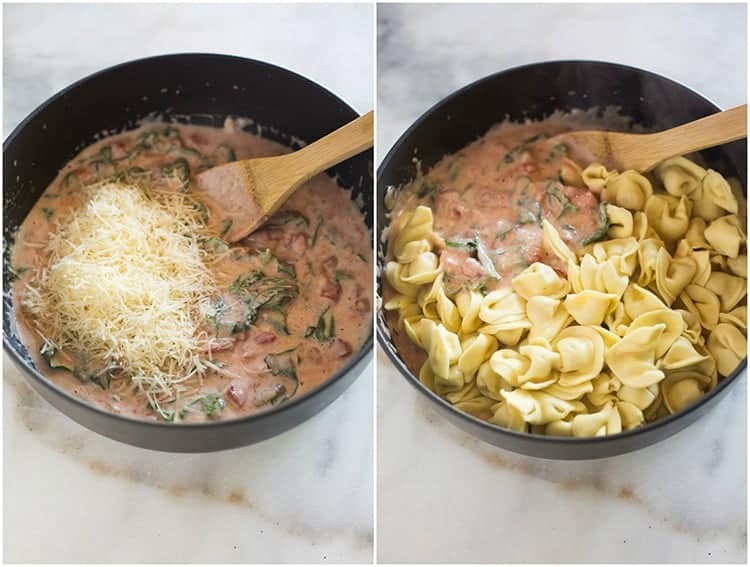 The recipe includes cheese tortellini in a creamy homemade pink sauce with spinach, basil, and fresh parmesan cheese. The only way dinner happens most nights is by taking advantage of my stock-pile of tried and true 30 minute meals. I rely on meals I can make really fast, with ingredients I have on hand, and something that my kids will eat without complaining. 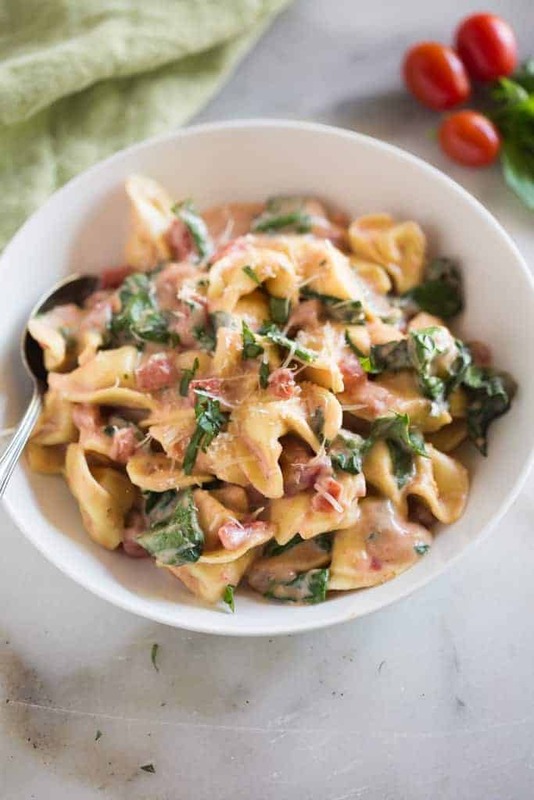 Creamy Tomato Spinach Tortellini fits the bill and is one of our family favorites! Start by cooking the tortellini. I prefer the refrigerated brand of tortellini best, because it’s the freshest. I typically buy the butoni brand. Cook the tortellini according to package instructions, in a pot of boiling water until tender. You will notice they will float to the top of the pot as they cook. Feel free to use any kind of filled tortellini in this recipe, like chicken or cheese. Then, make the a simple sauce in your sauce pan. Melt butter and add some flour. Add garlic and onion powder for flavor, and stir in milk and cream. Cook until the sauce simmer and thickens slightly. Add diced or fresh tomatoes, spinach, basil and oregano. Taste the sauce and adjust the seasonings if it needs it. more flavor. Add the parmesan cheese and cooked tortellini. Fresh shredded parmesan cheese will taste better and melt smoother than the pre-shredded packaged parmesan, but either will work. Give the pasta a gently toss to coat everything in the sauce. 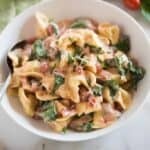 Creamy Tomato and Spinach Tortellini pasta recipe is made in less than 30 minutes and perfect for a quick and easy weeknight meal. 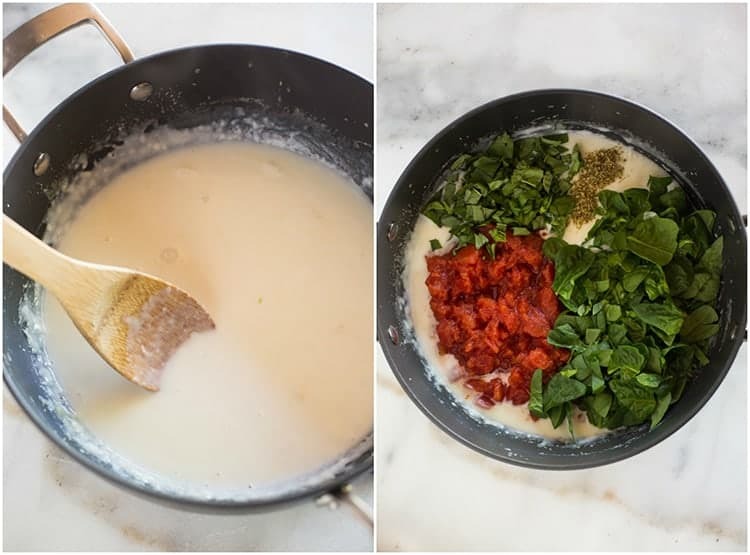 The recipe includes cheese tortellini in a creamy homemade pink sauce with spinach, basil, and fresh parmesan cheese. Cook tortellini according to package instructions. Drain and set aside. In a large saucepan over medium heat, add butter and cook until melted. Whisk in flour. Add garlic and and onion powder and cook, stirring, for 30 seconds. Slowly pour in milk and cream, whisking as you pour and stirring until smooth. Cook, stirring constantly, until mixture begins to simmer. Add diced tomatoes, spinach, basil and oregano. Taste and season with salt and pepper or add more seasonings if desired. Remove from heat. Stir in cooked tortellini. Serve warm with extra parmesan sprinkled on top, and crushed red pepper, if desired. Want to use fresh tomatoes, instead of canned? Substitute 1 1/2 cups diced tomatoes, and 1 cup of hot water that you used to boil the tortellini. *I originally shared this recipe in September 2014. Updated April 2018. This is A-mazing…my new go to pasta. Thanks Lauren!!! Thanks Kim! I’m glad you liked it! This recipe looks great but can you tell me where I’d find the recipe? There is no link? Hi Laurie, I’m so sorry, my site is having technical problems with the recipe card when viewed on a desktop or tablet device. You will be able to see the recipe if you pull it up on your mobile phone. I’m trying to resolve the problem ASAP. Sorry for the inconvenience! This recipe is really great, fast flavorful, and from scratch! My husband and 19 year old son really enjoy it. “Sneaking” in veggies is a bonus. I’ve made it per recipe but used dried basil. Leftovers are yummy as well. Thank you for posting. I look forward to exploring your website for more inspiration. Made this for dinner and finally everyone was happy!! My super picky 1 year old ate two (baby-sized) helpings and even got caught licking her plate afterwards! haha! Thank you so much for an easy but delicious recipe. I will definitely be making this again…and again! That makes me so happy! Thanks for sharing! I love pasta recipes. This one looks amazing. The more important thing is the time–30 minutes preparation time makes this recipe further attractive. This is delicious! I made it without cream and had to use lactose free milk. Turned out so well! Great recipe! Made this for dinner tonight and added ground Italian sausage to it. It was awesome! Will definitely make this again. Thank you for sharing this great recipe! That sounds delicious! I’m so happy you liked it, thanks for commenting! A family favorite! We have made this several times in the past couple of weeks. My kids are always asking for this, which is a true sign of a a keeper. Thank you for sharing! This was absolutely delicious! Quick and easy! I added shrimp and it really worked. Thank you for sharing. This will be my go to pasta dish!